Something that I need to do now and then is generate points along a line at supplied distance. 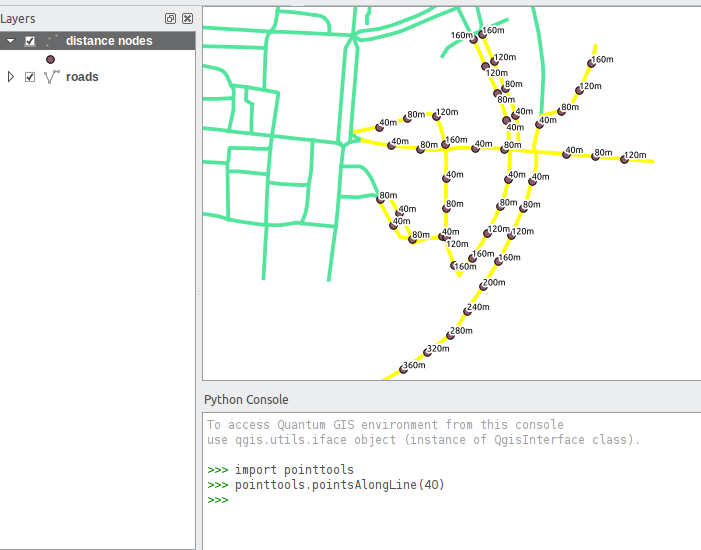 I had never really looked into doing it in QGIS until this question poped up on gis.stackexchange.com. This is a quick blog post because I thought it was a pretty handy little thing to do. The above code might look a bit scary at first if you have never done any Python/pyqgis but hopefully the comments will ease the pain a little. The main bit is the createPointsAt function. Cool! If we want to use this we can just stick it in a file in the .qgis/python folder (lets call it pointtools.py) and then run import pointtools in the python console. To generate nodes along different lines, select the new features, then call pointtools.pointsAlongLine(40) in the Python console. Not really. That tool creates new vertices on a line, also the new vertices are not equal distance. This generates a new point layer with equal distance points along that line. More useful for labelling a line with distance markers for reporting, etc. Great tool you ve got there! I am new at Python/Qgis and I was wondering how to make this point feature (not sure what kind object it is??) into a shapefile, within the script? But I don’t understand why I am not able to see the new layer of points created. The script is working since I have now a new shapefile, but I can’t see it. Nice tools Nathan and yes put it in the core library !!! Well, it’s 2016 now, and alas there’s a crack in the tool. You should use the QChainage plugin. This script is very old and isn’t updated for any of the new APIs. Ok, I’ll look for the plugin – but the script ~almost~ works, and it is maybe? a good place to start trying to learn a little… Thanks again.